Today's post features the new love of my life a gorgeous polish from a new to me indie brand! 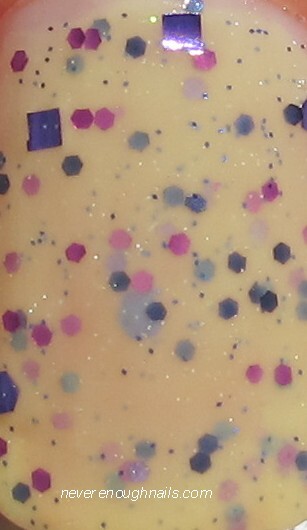 This soft yellow glittery concoction is The Polish Bar Eternal Sunshine! Janice, the lovely lady behind The Polish Bar, recently asked if I'd like to try some of her polishes, and I immediately focused on Eternal Sunshine. I love pale yellow polish when it's done well, and this baby is done really well! Eternal Sunshine is a creamy pale yellow with small purple square glitters, small purple and fuchsia hex glitters, and teeny navy glitters. JUST GORGEOUS!! Three coats of Eternal Sunshine is absolutely perfect! The yellow base is sheer enough to let the glitters show through, but quite opaque in three coats. It also was completely streak free! If you wanted more of a yellow look, you could layer this over a yellow base, but I'm really loving it as is. I wish Janice would teach mainstream polish companies how to make a non-streaky pale yellow! Eternal Sunshine just scream spring to me! I can't wait to wear it on one of those warm March days when you can just tell that spring is on the way. It would also help me get through one of those dim February days when I feel like spring will never come. If you, like me, have thus far been missing out on the amazing polish created by Janice of The Polish Bar, check out her Etsy store. Eternal Sunshine is in stock right now! To stay up to date with the latest news about The Polish Bar, check out The Polish Bar on Facebook. I have two more of her polishes to review, so stay tuned for those. OMG!! This nail color is so pretty. I super like the color and glitters on it. I find it classy and unique. Perfect for everyday wear. I agree Maria! It is quite unique and so pretty! It's not so yellow that it wouldn't flatter a lot of people either!